This might be a bit out of season now that Halloween has passed, but my experience with Halloween/Thanksgiving/Christmas melts is they're fairly interchangeable in the cooler months. That works out if you seem to've fallen behind on melting. This was a fairly monumental order for me because I finally decided to bite the bullet and try out some of Shannon's much praised bath and body! I placed my order on August 4th and it shipped on September 15th, within her stated turn around time. First, let's look at these gorgeous clamshells! Each one cost $3.75. Faerie Call: Fresh blackberries covered in clotted cream and topped with a layer of strawberry cotton candy. Faerie Bonfire: A complex bonfire scent with notes of leaves, vanilla, sandalwood, and brown sugar. Evernight: Lavender and lilac are highlighted with a touch of eucalyptus and blended with soft woods, white musk, and sugary vanilla. Illusions of the Labyrinth: Mandarin, musk, sugar, and a woodsy violet. Belladonna Tincture: A spicy blend of black pepper, patchouli, and vetiver; softened with mellow sandalwood. Deadly Gardens: Tonka bean, sparkling rose and jasmine, with notes of orange citrus and vetivert. Lots of rose and vetivert on cold sniff. Almost seems soapy to my nose. I paid $2 for 1.9 oz. On to the much anticipated bath and body! Cemetery Keys Whipped Soap: Vanilla tonka beans, lime citrus, and a sugary sweet white floral. Mummy Mademoioselle Sugar Scrub: Ground vanilla beans, rose petals, and jojoba spheres. Scented with candied rose jam, sweet sticky salt water taffy, and creamy white vanilla. Ever Night Whipped Soap: Lavender and lilac, highlighted with a touch of eucalyptus and blended with soft woods, white musk, and sugary vanilla. On to the freebies I received! Boo Berry Mansion Whipped Soap: Blueberry, strawberry, and vanilla with a heaping scoop of sweet sugar and iced birthday cake. Yummy blueberry-strawberry soap. I like using this to wash my hands after I've washed my face every night. Of course, then I dream about sweets and candies and wake up with a hankerin' for everything that is unhealthy for my body, but what can ya do? Storybook Mint Whipped Soap: Peppermint candies, milk cake, cotton candy, and fluffy spearmint meringue with subtle hints of apple. Lots and lots of mint. All I smell is peppermint candy. Which makes me further crave candy. Why do you do this to me, Shannon? Pumpkin Pie Spice: A dark and spicy pumpkin blend. Cardamom, nutmeg, cinnamon, ginger and fresh creamed pumpkin. Cardamom Potion: No scent description available. Glacier Blue: A refreshing peppermint scent that surprises with menthol, musk, and slight citrus notes. Cemetery Keys: Vanilla tonka beans, lime citrus, and a sugary sweet white floral. Bohemian Solstice: Blue raspberry snow, rich cream cheese bites, all topped with a lavender chamomile glaze. Winter Mint Cake: Rich hot chocolate, dark chocolate cake, and fresh peppermint meringue. Price breakdown time! Since this has more than just wax, the price/ounce before shipping will mean a lot more! I don't give the price/ounce shipped much thought, as about half of my order was non-wax items. My conclusion is Shannon runs a competitively priced, gorgeous-looking, spectacularly performing wax and bath and body company. In the words of Arnold Schwarzenegger, I'll be back. Have you ordered from The Bathing Garden before? 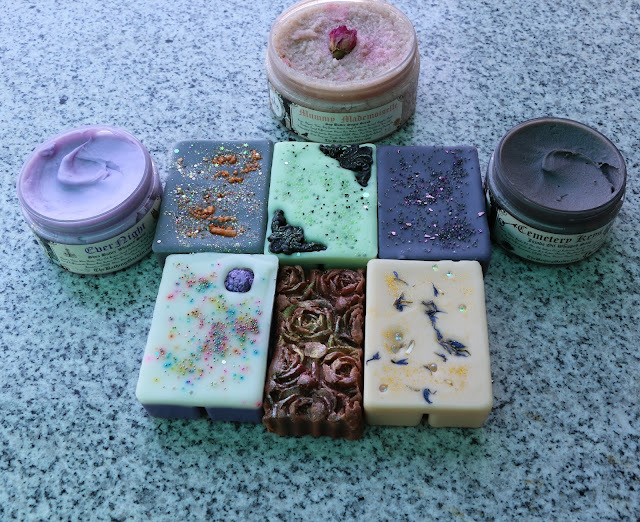 What do you think of her products? I think I am in LOVE!!!! LOL! What a fantastic order! I am glad you gave your thoughts on the Glacier one. I did order one clamshell in it but I may need to go back and get more. Ever Night is a dupe for Lush's Twilight, which is one of my favorite Lush scents ever. Isn't her Belladonna Tincture awesome?! One of the best Lord of Misrules out there. You and I are on the same page about that Cardamom scent. I had one brain in it, melted it, then wanted more. I have loved all your teaser photos on IG about this order. You did a fabulous job with the photos and descriptions. Shannon has a customer for life in me. I appreciate how she operates. Always open, rotating product and great customer service. I had forgotten Ever Night was a Lush dupe, yet again! It's different enough from my bath bombs that I feel like it's a brand new scent! Belladonna Tincture is ah-may-zing! Thank you for your kind words! <3 Shannon definitely has earned me as a return customer.